While this is not the Part 2 of the blog I promised -- that is still in the works -- I thought a blog post about food would satiate your appetite for my witty writing. Because let's be honest: who doesn't love reading about food? My biggest worry about moving to Kazakhstan -- more than the rough winters in Astana or even where I would live -- was what I would eat. As a vegetarian, the prospect of moving to a country where the national dishes require several forms of meat, where there is an etiquette in sharing and eating meat at the table, where the language includes 20 different words for parts of the horse, was a daunting one. True, I had survived in Russia, not exactly the bastion of vegetarianism, for six months, but there I had the good fortune of being placed in a host family where the mom was vegetarian. While I knew I'd have access to a kitchen here, I worried whether I would find the ingredients I depend on to make good, healthy vegetarian food. Besides, most of my days would be spent at the university -- and -- let's be honest here -- campus food has the distinct ability to be hit-or-miss even in the most vegetarian-friendly parts of the world. It took a few weeks for me to find my bearings, but my fears about food have largely been allayed. The university's cafeteria, which is for both students and the international faculty/staff, has an excellent variety of vegetarian dishes each day. Seriously, the food puts anything I've ever had at UW's Memorial Union or Northwestern's Norris Student Center to shame (though my fellow Wildcats will agree that Norris isn't exactly the standard bearer of good food). Though on one occasion I found an extraneous slab of meat in my "vegetarian" soup, in general, I'm not just eating potatoes and bread everyday. My favorite cafeteria offering -- which can make or break a day at work -- is a stew-like mix of eggplant, squash, carrots and potatoes. Plus, they offer a spicy chili sauce, a Kazakhstani version of Sriracha, that I pretty much just dump on everything, including pasta, to the amusement and befuddlement of the cafeteria staff. Cooking for myself -- or, really, for me and Omar since there's no use in making stuff on my own and not sharing -- became easier once I discovered the wealth of produce at the local bazaars. At first, our meals were somewhat simple -- kasha with vegetables, vegetable soup and vareniki (Russian dumplings, similar to pierogi) -- but we've become more adventurous in our culinary experiments as we've found more specialized ingredients. Last weekend, Omar spotted some "plov spice" (plov is the quintessential Central Asian dish -- a mix of rice, meat, veggies and spices that are slow cooked**) at the bazaar, which prompted us to experiment with creating a vegetarian-friendly version of the dish. We sauteed onions, carrots and potatoes with the spice mix, then added rice and garlic cloves, allowing the mixture to slowly simmer until ready (the trick to plov is that ingredients cook in layers and are only mixed at the end before serving). The results may not have been authentic by any means, but our "plov" was aromatic and delicious, and I may have eaten far more than my fair share of it. I think next time I want to add chickpeas and maybe some chopped dried apricots for extra flavor. This week I also managed to do something that I generally struggle with even in the United States: duplicate one of my mother's recipes with some success. It's not that I'm a bad cook; it's just that the dishes never quite turn out the way they do when she makes them, so I typically congratulate myself whenever I make something that vaguely approaches her level. Obviously, I am giving myself extra points for making any of her recipes while in Kazakhstan, whether or not they turn out the way she'd make them! Last weekend, while shopping at the bazaar, I was ecstatic to find cilantro (oh glorious cilantro!!!) and a selection of spices, including turmeric. Once I spotted a vendor selling pumpkin, I knew the food gods were begging me to introduce Kazakhstan to a family staple -- and one of my favorite dishes of all time -- pumpkin masala. Now I know you're thinking, this sounds amazing but you can't quite recall if you've ever the pleasure of sampling it at your local Indian buffet. Chances are you never have. Pumpkin curry (baakar bhaji) is a popular dish in Maharashtra, a state in western India whose cuisine has a unique flavor profile quite unlike anything you find at generic Indian restaurants, and this particular recipe was something my grandmother learned from a Maharashtrian friend. It's been passed down through the family to my mother and me -- and, now, I've decided that it should be passed onto you, dear reader, because good food is meant to be shared. You'll find the recipe below the photo, which should whet your appetite! 1. Sauté the cumin on the oil/ghee over medium heat in a heavy pan for 1-2 minutes until fragrant. Add the ginger and onion. Continue to sauté until the onions are soft. 2. Add the squash and sauté for a few more minutes. 3. Add the spices and salt. Add the 1/2 cup of water. Bring to a steady simmer. 4. Reduce the heat to medium-low, cover and cook until the squash is soft -- generally about 15-20 minutes. Occasionally stir. The squash should be pretty soft -- almost mushy -- but still holding its general shape. 5. Before serving, you can add chopped cilantro and salt to taste. Best served with naan or any kind of flatbread. Today I had the pleasure of eating some of the best home-cooked food I've had so far in Kazakhstan (to be fair, I haven't had that much home-cooked food beyond my own, but even if I had, this would still rank as the best). Last week Omar and I contacted Marzhan, our Kazakh language teacher from Madison who had returned to Astana after our first year of graduate school. Of course, she invited us home for lunch, and, not surprisingly, she prepared a stunning spread of food, including homemade manti (Kazakh dumplings), salads, cabbage latkes, fruit, tea and seven different kinds of cake. Manti are steamed dumplings that typically have a meat-filling, but Marzhan created a vegetarian version for me with pumpkin and potatoes. Our lunch lasted several hours, enough time for me to eat about a dozen or so manti at Marzhan's constant insistence that we "eat more," and, of course, have several cups of tea. Manti with pumpkin and potato filling! My plate of food, which was refilled many times. Seriously full. Do you see the 7 kinds of cake?? One of the things I love about this part of the world -- and this holds for many Mediterranean and Asian countries as well -- is the deep relationship between food and hosting guests. The Russian word "gostepriimstvo" (likewise the Kazakh "qonaqzhailyilyiq") is always badly translated into English as "hospitality," but it represents so much more than just that. As a guest in Russia and in Kazakhstan, your host will ply you with food, drinks and entertainment that you begin to think you are somehow the most honored person to walk in through their doors. I think most Americans would be slightly embarrassed and perhaps a bit suspicious of this attention, but it is customarily expected in Russian and Kazakh homes. Not having twice the amount of food needed for a small party would certainly be considered rude, so it is hardly surprising that we came away from today's lunch both stuffed to the hilt and with several bags of leftovers. My new food goal, other than trying to make chana masala in the near future, is to learn to make manti while I am in Kazakhstan. Again, my vegetarian version may not be quite as authentic, but I still like to think the best way to experience the culture of another country is through its food. **Plov is also one of my favorite examples in history of how food transcends borders, and reflects centuries of trade, conquest and intermingling. Not only is the Central Asian (Uzbek) plov a cousin of the Indian pulao and Turkish pilav, but it also resembles both paella and risotto in the way it is prepared. Obvious differences exist, but the fact that a simple rice dish is present across cuisines is a reminder of how we are well, for better or for worse, part of a bigger narrative. For decades environmentalists have been warning us that the demise of the human race may not be brought on by our technological weapons, but by a much simpler -- and scarier -- problem: the lack of water. Future wars, they predict, will not be fought for jingoistic reasons, but over water rights. The concept that there isn't enough water to go around is difficult for those of us in the developed world to wrap our brains around because we rarely, if ever, face a time when water doesn't flow out of our faucets and hoses. In the American Southwest -- as well as in Texas, which experienced the worst drought in decades last year -- we water our manicured lawns year-round, creating artificial oases to satisfy our aesthetic needs without considering for an instant the damage we are inflicting on this precious resource. In the rest of the world -- even in the most advanced "developing" nations -- lack of infrastructure compounded by diminishing resources has complicated billions of ordinary lives. As a child in New Delhi, I remember the gallons of water we kept around our house that would be refilled in the 30 minutes when water would flow freely through the faucets during the height of the summer drought. A particular image -- that of the Jamuna river dried up in its bed -- is strangely imprinted in my memory, and it is that memory I returned to this week after several days of experiencing water-related mishaps. On Tuesday morning, in the middle of my shower, just as I had put shampoo in my hair, I heard the shower faucet sputter and then quietly turn off. After my initial panic abated -- luckily, I had some water left in my kettle to make a cup of tea to calm myself down -- I went downstairs to inquire if this was a building-wide problem. (I did dry myself off and put on clothes before doing that...). Naturally, I got an unsatisfactorily vague answer from the dezhurnaya on duty, who called the repair man and assured me it would be "fixed soon." Several hours later, with shampoo dried into my hair and still no sign of water flowing from the faucets, I decided to take matters into my own hands. Years of living and visiting India have taught me two extremely valuable lifeskills that I have occasionally had to revive: how to bathe with no running water, and how to properly use a squat-toilet. With the remaining water in the kettle, I managed to wash the shampoo out of my hair and take something just a shade better than a sponge bath. At work, I found out the university was experiencing its share of water problems, though these were blamed on the massive amounts of ongoing construction on campus. Nevertheless, it appeared the lack of water was a citywide issue, not just another cruel joke on me personally. Over the next few days -- really, until last night -- the water continued an unpredictable course of shutting off and on with little warning. Some days there was hot water, some days only cold, and some days, nothing. After my Tuesday experience, though, I was prepared, and took mostly what I like refer to as "Third World" showers (or, you know, Global South showers, if you want to use slightly less offensive language), using my kettle to boil the water and my laundry bucket to mix it with cold water. No hot water? No problem. All you need is a kettle and some sort of tub! Of course, this got me thinking. The average 8-minute shower uses about 62 liters of water, according to this BBC News story. I managed relatively the same on 8 to 10 liters. True, I probably would have liked to use a little bit more water, but even if I added 5 to 7 more liters, that still brings my total to about 1/4th of the water consumption in an average shower. So, why is it, exactly, that we haven't adopted a less-wasteful shower regimen? Though I suspect the water problems this week were related to infrastructure development, the larger issue of water resources looms large in Central Asia. All five post-Soviet republics rely on the rivers that flow through their shared borders for water, agriculture and electricity, and while Uzbek President Islam Karimov's recent ominous prediction of a water-related war was hyperbolic, it is not all that far-fetched. The region's two major rivers -- the Syr Darya (Jaxartes) and Amu Darya (Oxus) -- meander across the borders of all five countries and Afghanistan. Future plans to dam rivers upstream in Tajikistan and Kyrgyzstan, where the population relies on hydroelectric power, will undoubtedly affect Uzbekistan and Kazakhstan downstream. Water resources often play a role in political leverage. In 2010, when Kazakhstan closed its borders with Kyrgyzstan after a popular uprising, the Kyrgyz government shut off the water flow from the Talas river into eastern Kazakhstan. The flow was restored days after the border reopened. The role of water resources in Central Asia is not a modern -- or post-Soviet -- problem. (In fact, my cousin wrote her dissertation on the contestation of water rights in Central Asia under Russian rule -- I'm hoping that's an accurate description of her work!). Likewise, the desiccation of the Aral Sea, which continues to shrink each year, is largely related to diversion of water resources in the Soviet era. 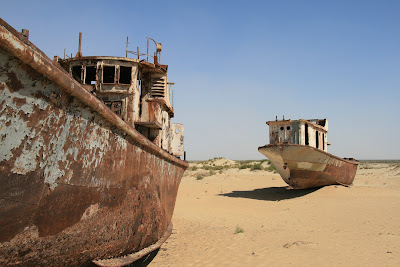 Photo of the Aral Sea in Uzbekistan (from user: kvitlauk on Flickr). Diminishing water resources -- or potential fights over those resources -- are not limited to Central Asia. The southern Indian states of Tamil Nadu and Karnataka, the region where my family is from, are engaged in a decades-long standoff over the rights to control the Kaveri (Cauvery) river that straddles the border and is the lifeblood of major cities in both states. The population growth on both sides of the Rio Grande river has complicated efforts by states to hold up their end of the compact that ensures water flows downstream into the Gulf of Mexico. In short, we are seeing glimpses of the future in which fights over water -- and the lack of water -- will be commonplace all over the globe. So, even though there's water flowing quite freely out of my faucet today, I hope this experience, while frustrating and inconvenient, will remind me that I, too, am far too complacent about my own water use. I'm not quite ready to give up showers -- those of you who know me well know my love of showers -- but I think I can start by taking shorter, more effective ones. Next time on this blog: When every conversation turns into a discussion about nationalism.